Henry David Thoreau wrote, "It's not what you look at that matters, it's what you see." It seems that every time I am in some kind of transition, both positive and negative, everything around me becomes more vibrant and memorable. Light intensifies, colors sharpen, and seemingly rare or unlikely events stack up, as though the universe itself is nodding its approval in my direction. This trip, which has the simple purpose of shuttling my belongings from Juneau to Anchorage, so far has been spectacular. I woke up at 4:30 a.m. Easter Sunday to three inches of fresh snow. I drove to the ferry terminal feeling as though I was emerging from deep water, slow and breathless. I tried to shake off the two hours I had slept and gazed dreamily at the ghostly trees, powder-drenched and glowing in the pre-dawn moonlight. Juneau has had so little sea-level snow in 2010 that I had almost forgotten how beautiful the city becomes when washed white. When I pulled my car up to the boat, the purser asked me where I drove from that morning. "Douglas," I replied. "Wow," he said, "You actually managed to get that here?," referring to my overloaded, small and old, low-riding car that I had to plow through three inches of wet snow along 15 miles of uncleared streets. 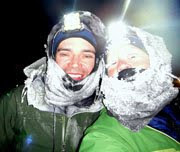 I realized that new snow in Juneau likely also meant new snow in Skagway, which did not bode well for Geo's ascent of White Pass. I tried to put that fact out of my mind, hoping providence would intervene. 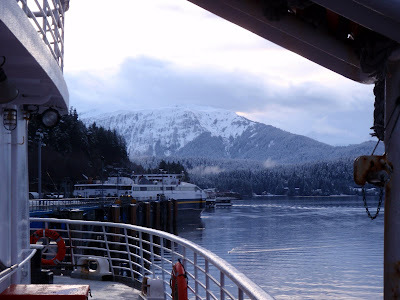 I stood out on the side deck as the ferry pulled away, watching as my former house at Fritz Cove, Thunder Mountain and the Mendenhall Glacier faded into the distance. It was all so fantastically beautiful, dusted with snow and wisps of clouds. I indulged in a few tears because I was having a much harder time leaving it behind than I'd expected, and it felt good to physically acknowledge it. 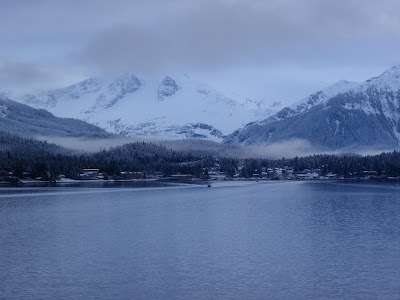 But a six-hour ferry ride injected with several unsatisfying 10-minute naps will dull even the sharpest heartbreak, and by the time I reached Skagway, I was just glad to see that the clouds were breaking up and there didn't seem to be any new snow on the road. White Pass, miles 0 to 14, was one of my biggest worries for making this trip with my car, because it's steep with regular bad weather and limited maintenance. 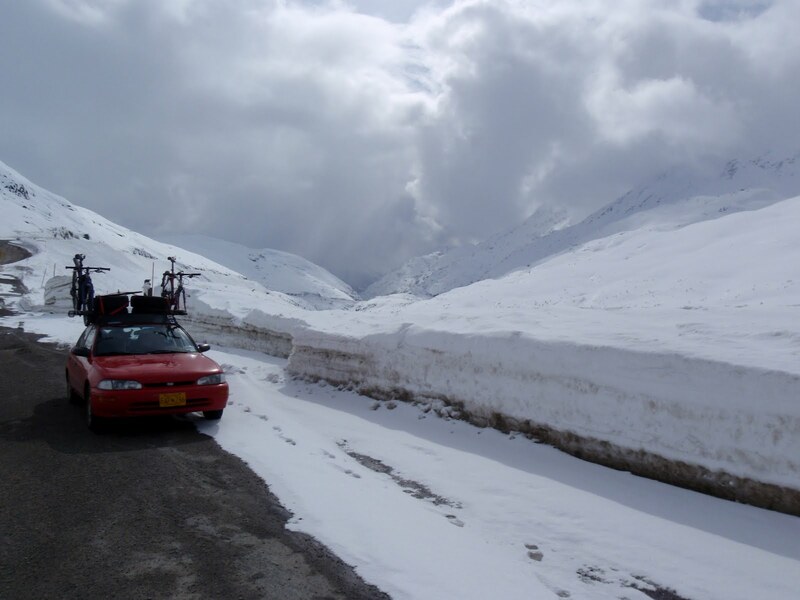 Happily, the road was clear and I reached the top without any mishaps. The first sunlight of the day broke out right at the top, where I stopped to take this picture at the U.S./Canada border. I think I was more proud of Geo for making the climb than I ever have been of myself for doing the same on a bicycle. I also learned that in Canada, Easter Monday is a holiday as well. 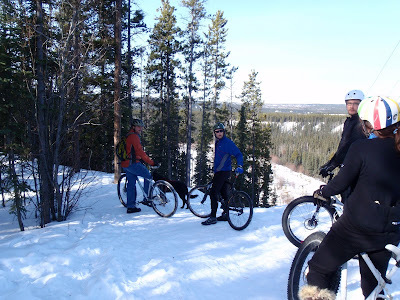 Which meant my friends were available for a Monday morning ride on a tight, rolling loop of foot-packed snow singletrack. 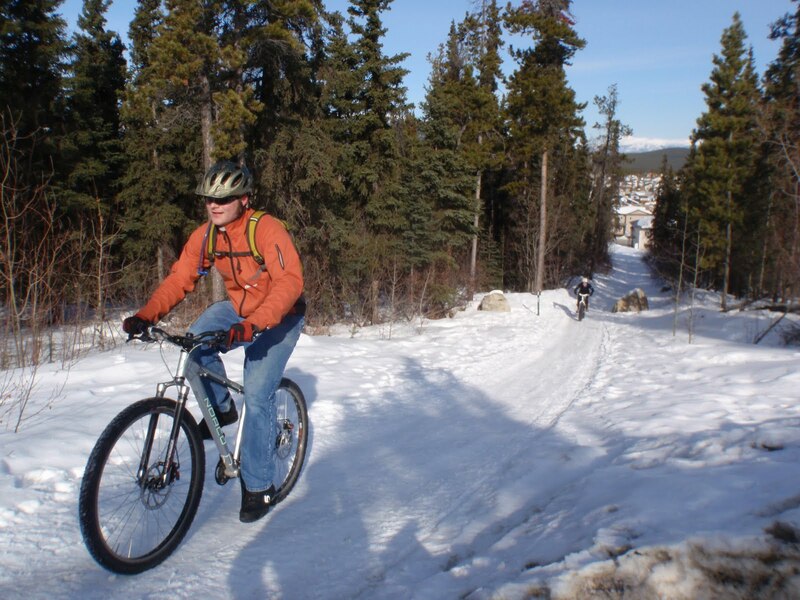 I actually haven't ridden my bike once since returning from Fairbanks. My knee still bothers me when I turn pedals, but I could hardly resist such an opportunity. I felt sorely out of practice and had a difficult time finding a flow. Even taking it easy off the back of the group, I still hooked one tree, and another time dropped into a rut and flipped over the handlebars into a mercifully soft snowbank. The trail was quite icy and really encouraged speed, not always a good thing. But it was tons of fun. In fact, riding really doesn't get any better in the north in April. 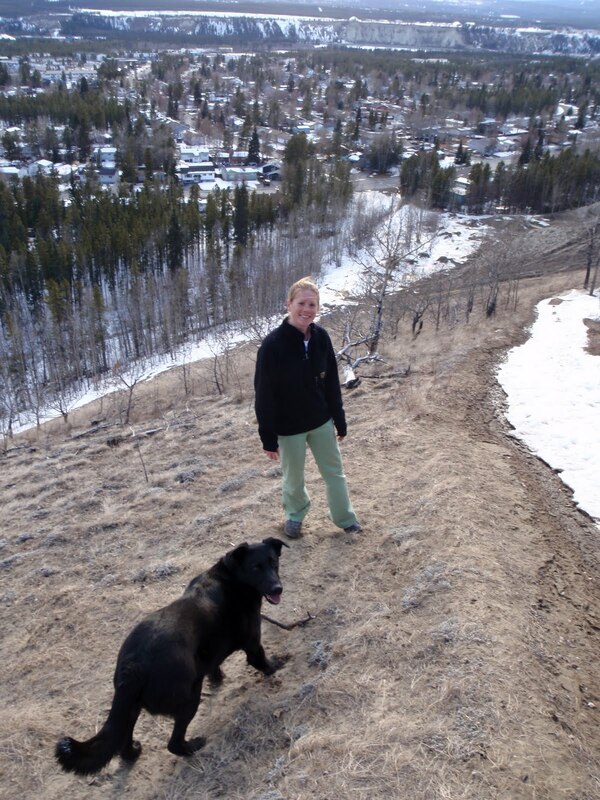 Anchorage is probably already well into its spring slush phase, and Juneau has been in that phase since November. After the ride, it was time to roll northwest. It was a beautiful day for driving, about 35 degrees, partly cloudy with generous hits of sunlight. I kept my window rolled down and blasted the heat at the same time, both in an effort to keep my car from overheating and to breathe the crisp, sweet air. I happily drank can after can of Diet Pepsi (when I am driving, I let myself drink as much caffeine as I want. I will worry about the cavities and cancer when I am not operating a vehicle.) I was in a great mood and even let my cat, who has been in a perpetual state of annoyance since I moved her out of my old house, out of her kennel so she could sit on my lap. Shortly after I did this, we came upon a lynx prowling alongside the road. "Look Cady," I said to my cat as though I was cooing at a 2-year-old, "Big Kitty." I stopped the car and watched as the lynx repeatedly dove into the snow and sometimes emerged with a small rodent in its mouth. It would gulp down the tiny gray morsel and continue on its way, not caring in the least that I was inching my car down the road beside it like the worst kind of gawking RV tourist. Luckily, there was no traffic. Cady propped herself up on the windowsill and mewed quietly for several seconds before deciding to crawl below the driver's seat. 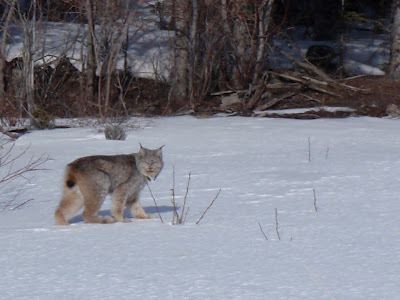 I followed the lynx for about five minutes, completely enthralled as it hunted and prowled, watching its giant feet move effortlessly over the crusty snowpack. Every few steps, one of its thick legs would punch all the way though, and I felt emboldened by the realization that even lynx posthole sometimes. Here's a pixilated shot with the digital zoom. As much as I love photo-documenting, there are actually relatively few times that I feel truly cheated by the fact that I do not own a "real" camera. Today was one of those times. The wildlife sightings stacked up heavily throughout the Yukon. I saw a bull moose standing alone in a field. I watched two small groups of caribou dart across the road. 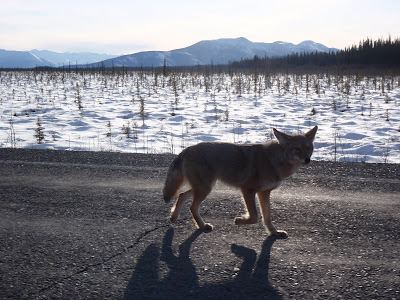 Near Destruction Bay, I came upon a coyote standing in the middle of the road. I had to hit the brakes and slow to a near halt before it finally moved out of the way. 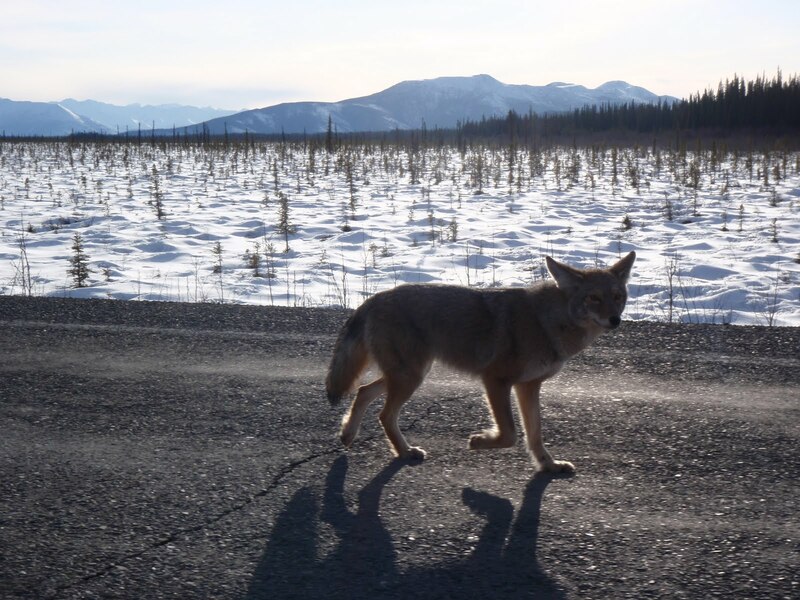 As I began to drive forward again, it trotted alongside me - obviously, this poor coyote had been fed at some point, and thus has become unnaturally interested in cars. It was a beautiful creature, though. Big ears, shiny fur. Even habituated as it was, it is a special experience to look so closely into the eyes of a wild predator. I continued driving to keep it from actually approaching my window, and it kept running alongside the car. Cady, who emerged from the seat after we slowed down, even crawled onto my lap again to see what all the commotion was about. 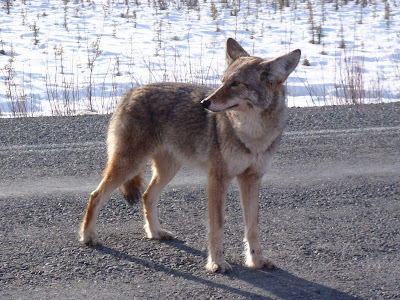 When she saw the coyote, she hissed loudly the same way she does when she sees a dog. The coyote jumped back, obviously startled, and I laughed out loud. Some animal interactions know no boundaries. I made it to Tok before sunset and decided to stop here for the night. I wanted to camp, but the low temperature is supposed to be 14 tonight and I didn't know how well my cat would handle that inside the car. I'm hoping my knee will loosen up for a short ride in the morning, maybe on the famous "bike path to nowhere," before coaxing Geo the final 350 miles into Anchorage. That is funny about your cat hissing at the coyote. Made me smile. Beautiful images and good luck. What an amazing way to leave Juneau. How big was the lynx? Like medium sized dog? His paws are HUGE! I'm enjoying reading about this phase of your life. 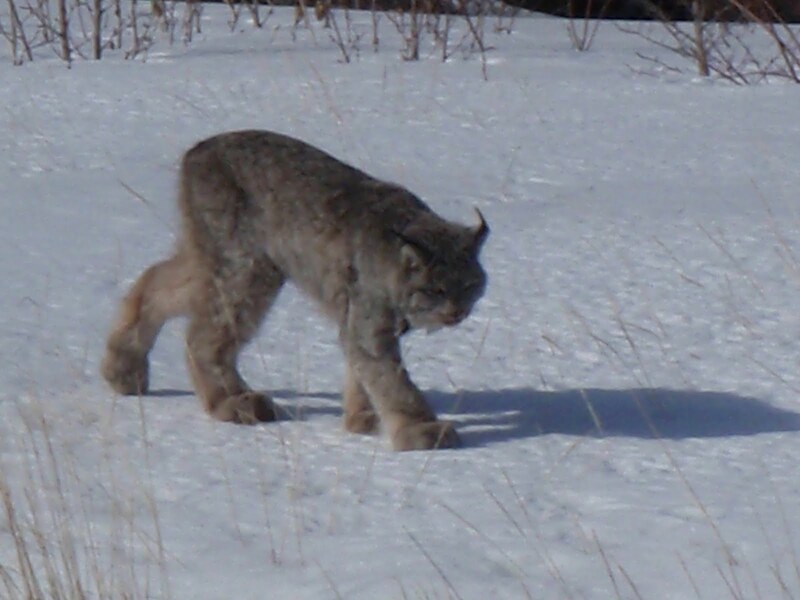 Thanks for posting the lynx photos. Definitely a higher leg-to-belly ratio than our little furry friends! That lynx is insane!! Glad you made it safely over the Pass. Good luck with the rest of your trip--call us when you get there! Yup, that Lynx looks twice as large as what we see (rarely) in the lower 48! 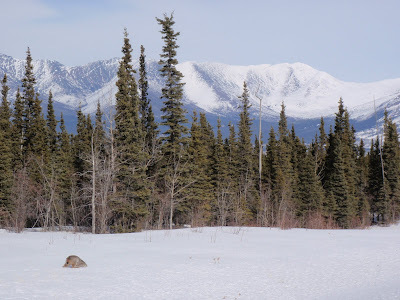 Gosh, I remember that drive (drove from Juneau to Anchorage back in 1991)...broke down in Tok, as a matter of fact...glad you had a better time of it! Amazing shots of the Lynx. 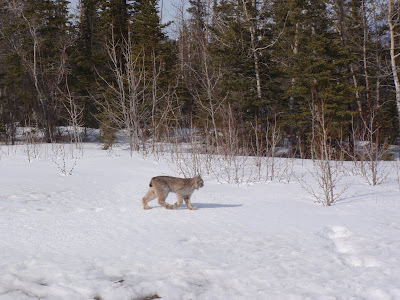 I've had one lynx sighting here in Northern Minnesota back in 2001. I'll never forget it. It looked to be about the same size as the one here. I remember reading at the time the experts were saying there were no longer any Lynx in Minnesota. My sighting proved them wrong. The lynx photos are impressive! You were blessed to have such a close encounter. I share your feeling of having a great photo opportunity and needing to document it with an undesirable camera. Even with your point-and-shoot Olympus, you can often tease out acceptable image quality by using prepress tools such as unsharp masking (USM), global and selective color correction, and kelvin temperature adjustment. You can find these tools in Photoshop or Photoshop Elements among others. Good luck with your relocation to Anchorage.